The litany repeated every morning when I left for school, then later, when I went out to work. As if I could forget! “Yes, Mom.” The reply was a “stop-nagging” whine. It changed on Sundays. “Have you got your handkerchief? 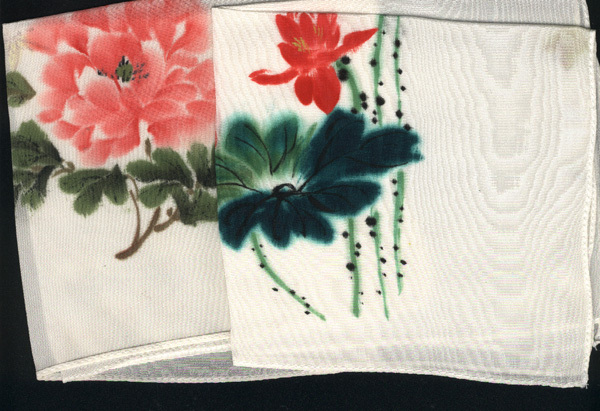 Do you have some money for collection?” Always, a nice girl would need a handkerchief. One did not touch one’s face. Or at least, we were not supposed to, but I was always getting chided for this sin of commission. And of course, if you had sniffles…. I brought the shoe box up to my nose. It was full of handkerchiefs and there were a few head scarves as well. It had an old smell, not musty, but of face powder and bath salts that women seldom use these days. 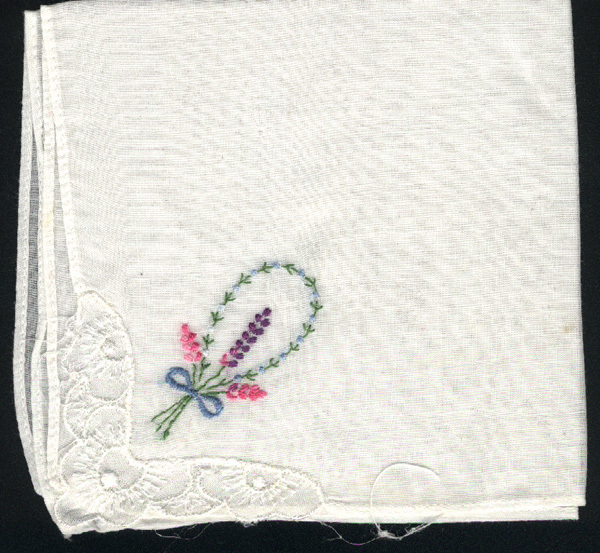 I noticed one day that my friend Geraldine carried cloth hankerchiefs and remarked on it. “My box runneth over with handkerchiefs, ” I mused. And here was the box with wrinkled and mussy handkerchiefs still smelling of Mom and her toiletries. 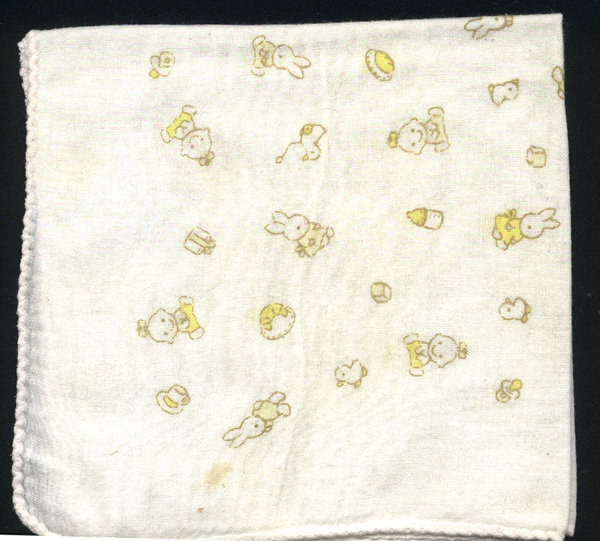 Just as mother was reaching her teenage years, Kleenex made its debut in 1924, designed as a facial tissue made of “Cellucotton” to wipe cold cream or make-up from one’s face. But it was The Depression and resources were scare. 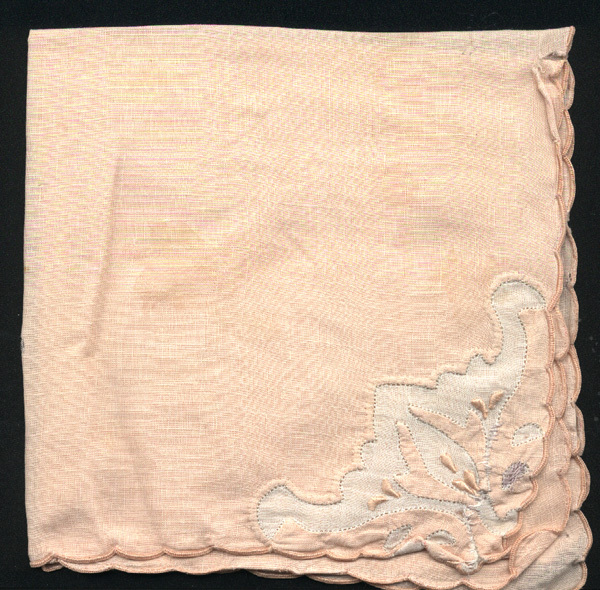 A cloth hankie could be used over and over again, but a tissue could be used but once. 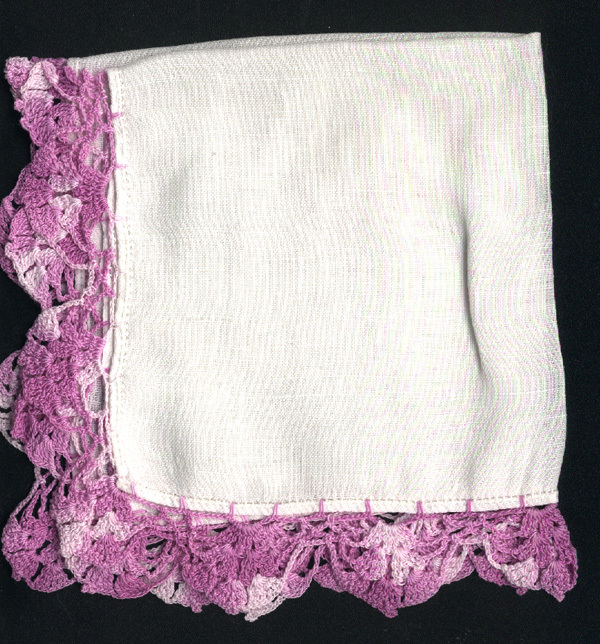 I left the sixty-plus handkerchiefs to soak in a basin of hot water laced with a delicate-fabric soap and came back to rinse them and dry them a few hours later. In a futile attempt to save time, I did not take them to the basement and the automatic clothes dryer, but began to stretch them, as Mother used to do, flat on the bathroom counter, but I quickly ran out or space and began to hang them out on the towel racks, along the edge of the laundry basket and all along the bathtub rim, and I was only half way through. Later in the afternoon, I came back to do the other half and take the dry ones to iron. 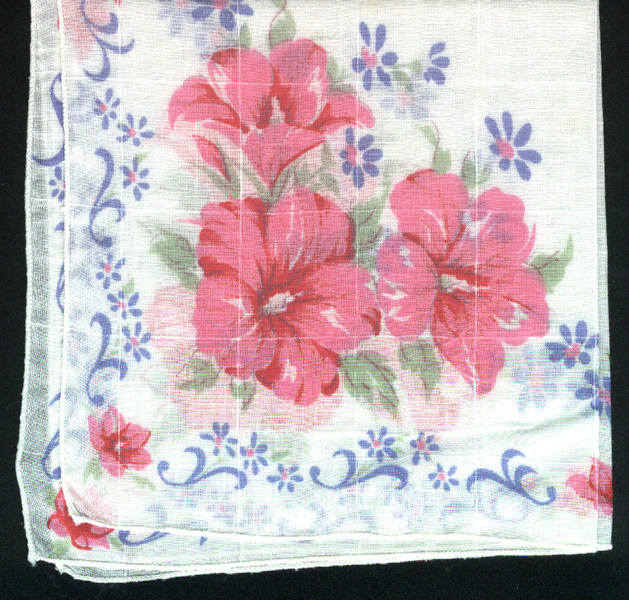 As I pressed the first one, a light translucent cotton printed with a gay pattern of red and blue flowers, it came to mind that I must have learned to iron on these practical little squares of cloth, something that a child of seven could not ruin easily in her first domestic ironings. 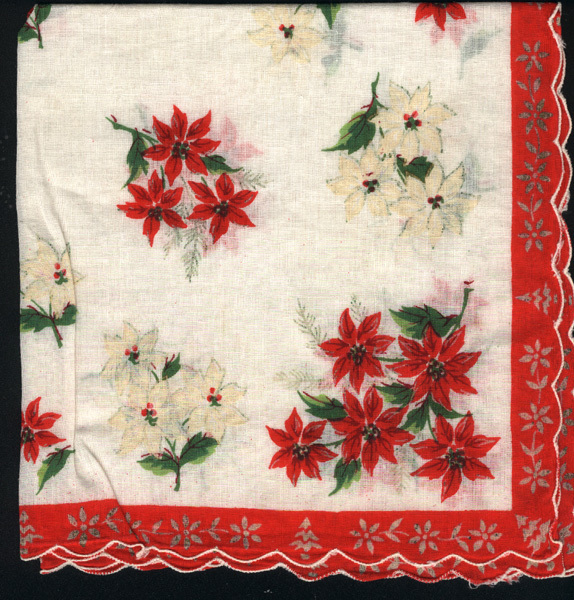 As I continued on the task, I became conscious that I only had six matching handkerchief. Every other one was different. 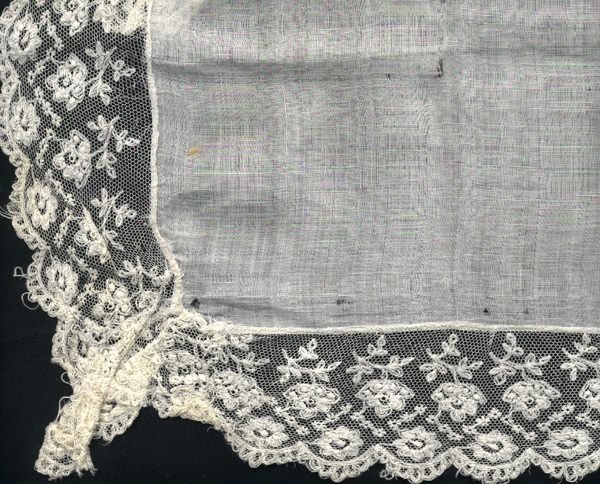 The needle work is often hand-done with a finesse that is rarely seen today and the fabrics are so sheer, sometimes, that I marvel at the delicacy of it. 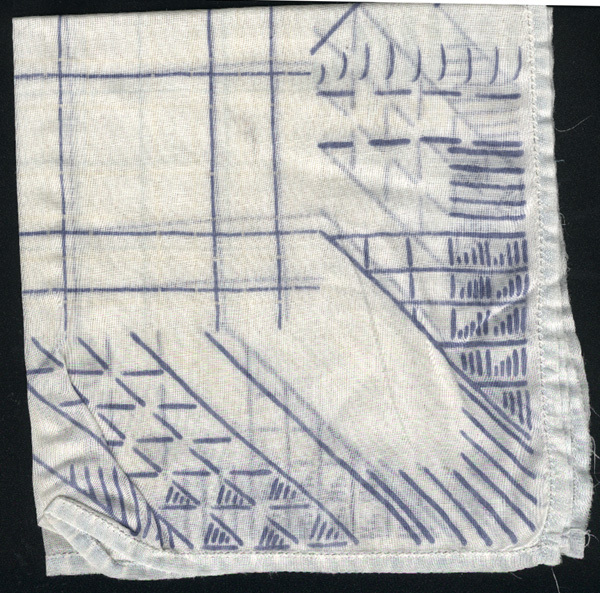 How do they spin the cotton so fine so that the fiber is strong enough not to break in the weaving process and yet so small in diameter that the fabric is almost see-through. and some have curious, modern calligraphy upon them. And this nest one was her favorite. It was the kind a flirtatious woman could drop on the floor and her eager swain would stoop to rescue. Father passed away in 1983. One day when I was visiting, before I came to live with her, to care for her, we had a cup of tea in the afternoon and she was being coy. Something was on her mind that she wanted to say but she wasn’t sure what my reaction would be, I discovered later. Finally, she told me she had received a letter from one of Dad’s and her university acquaintances whom they had kept in touch with all their lives. He was an prominent Engineer – a brilliant man, she assured me. I struggled with the chicken scratchings that marked the page. I was teasing her. There were occasional words that were recognizable. With a bit of effort, the entirety could be decoded. I read it to her haltingly as I deciphered it. I suspected that she already knew, that she had already read the letter and knew its contents. She had an expression on her face that made me think of a wary animal waiting, not knowing if she were to be caressed or smacked.Timid. Unsure. Now I knew why she was being shy and coy! She was over eighty, but she was thinking of him as a suitor, a beau, a potential boyfriend. On the twenty-fourth, I was summoned to get her to the hair dresser, then to help her dress. I brushed her clothes to ensure there was not a hair out of place, nor an escapee dangler left on her shoulders. I polished her favorite necklace – a Haida silver man-in-the-moon pendant. She sat at her dresser, her sterling brush set sitting before her, as she trimmed her nails and put on polish, then selected a bracelet to go with the pendant. I put it on for her and secured the latch of it. She selected a perfume and dabbed it behind her ears. She powdered her cheeks and brushed on rouge then wiped it away gently with a paper tissue. Nervously, she fingered the little cut crystal pots with silver lids that were her pride and joy – her symbols of ladyship – and moved them, reorganized them, tidied them. She leaned into the mirror, puckered her lips and carefully drew over her lips with a strong red lipstick. Into her evening bag, she slipped into it a twenty dollar bill, her lipstick, a compact with rouge, her driver’s license (though she no longer drove), a comb and a nail file. “Do I look OK?” she asked when she was all done. She was unsure. Excited. Like for a first date. 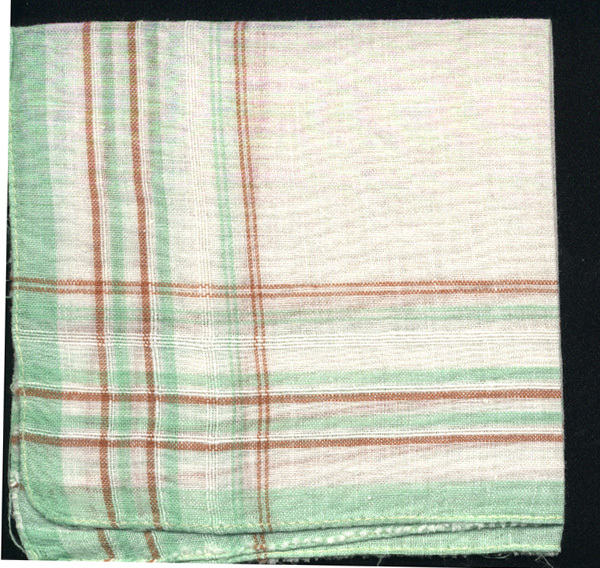 “Have you got a handkerchief?” I asked. She hadn’t. It was the last thing to do. 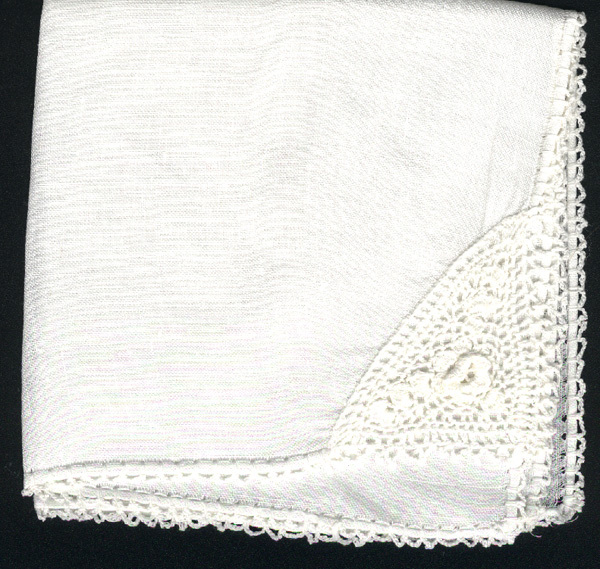 She opened the top drawer beside her, pulled out a wad ironed handkerchiefs and picked out this one, her very best, with hand-made Belgian lace and a ruffle on each corner. Soft and refined. The kind one could drop, for a suitor to pick up and admire. And she tucked it into her sleeve. It’s threadbare now, but that doesn’t matter. I think I will keep this one, in memory. You need to read yesterday’s post to see why these photos are amazing. Yesterday was fog. Today is sunshine. Each with their own beauty. 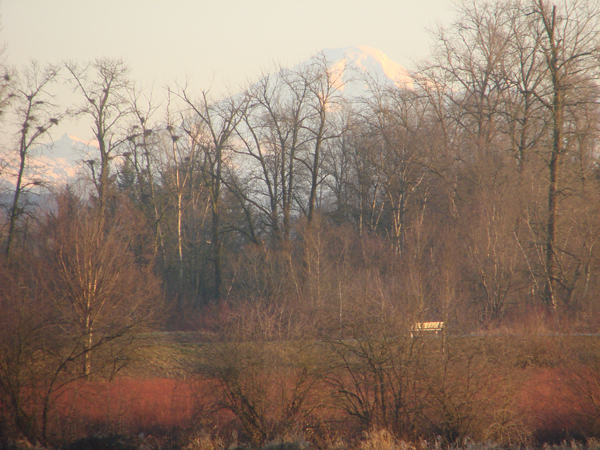 There is incredible warmth in the landscape despite the winterization of all the vegetation. 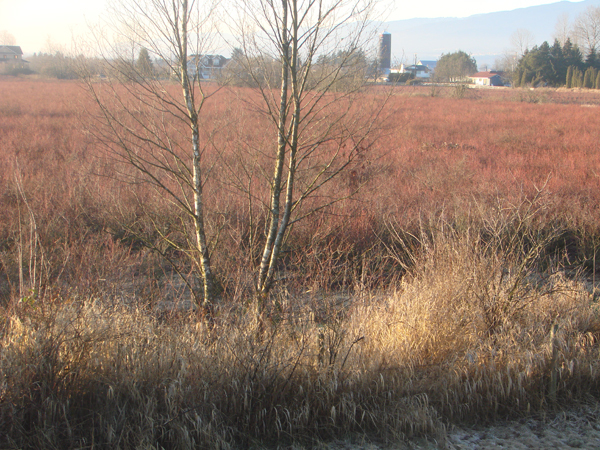 We are exceptionally lucky to have the blueberry bushes that go flaming red on the landscape and then the river grasses that go gold. The long shadows help define everything in crisp delineation. No more commentary required: the pictures speak for themselves. If you flip back and forth, you will see that several of these are of the same spots in the landscape. 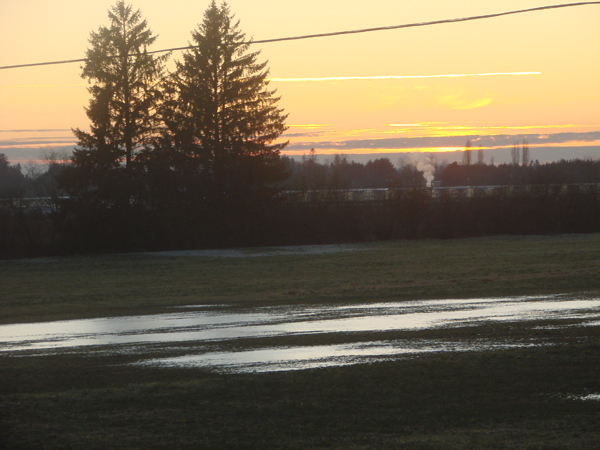 After the heavy rains last week the fields filled with water, but the ponds are abating now. 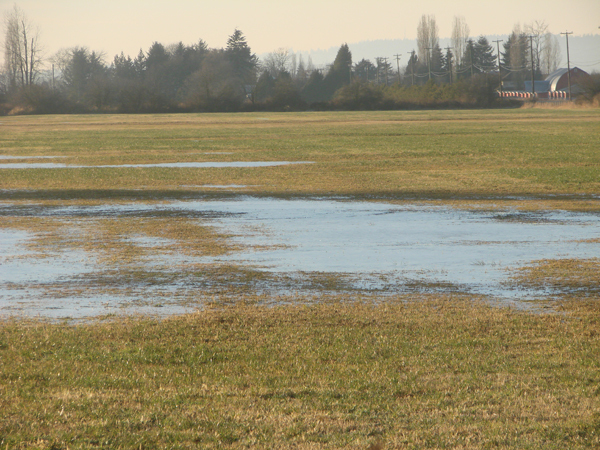 There were a hundred ducks and and a few seagulls in this field last week, swimming inland. 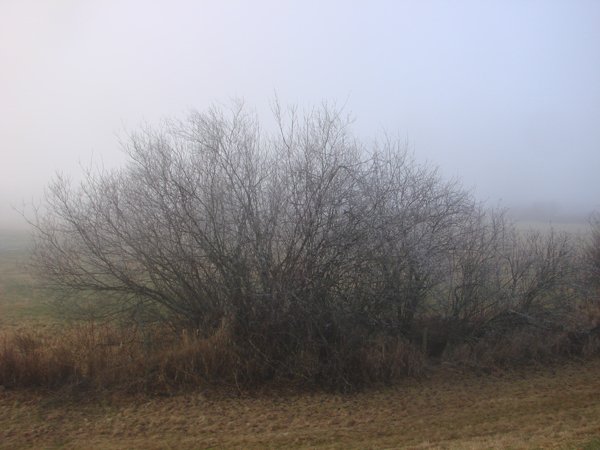 The tree below is one of the trees I showed in the previous post, in fog. Weather and business. Great excuses. I haven’t been out walking for a long time. Christmas, though, came with some beautiful weather. There was actually some sunshine. Non-sequitur: I jumped on the bathroom scale. Oops! Christmas baking gain! I kicked the bathroom scale. It has the nerve not to be lying. Five pounds last year. Five pounds this year. Time to go do something about it. Midday on Boxing day, it was two degrees above, Celsius. I put on my Winnipeg parka with fur-trimmed hood and plenty of fluffy down. I zipped on my warm winter boots. I found my gloves with lambskin lining that I purchased when I went to Ottawa to see Hugh for Christmas two years ago. Non-sequitur #2 : Hugh has his Masters. Whoopee! 93% average. Good going Hugh! 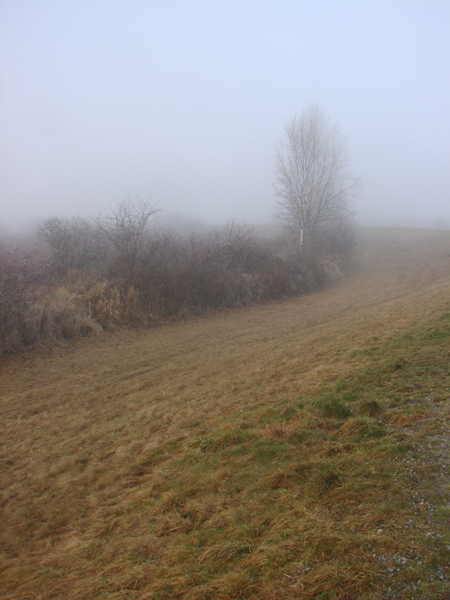 I picked up my house and car keys; set the house alarm; exited North; got in the car; drove down the hill and into a bank of fog, to the Alouette Dikes. 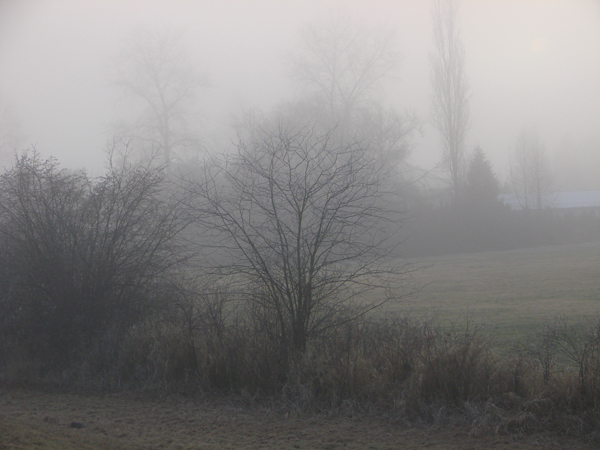 There is an eerie beauty in fog. I took lots of pictures. It only slightly detracts from the walking exercise. Well, maybe a bit more than slightly, but if I didn’t have the camera along, I probably wouldn’t have been inspired to go. I am going to have to go walking more than once if I am to have any effect on my winter waistline. I will also have to go to the gym. Regularly. Rats! 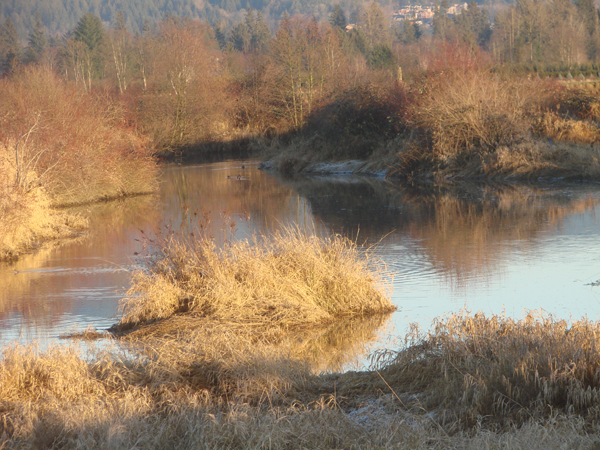 Sunday, the day after Boxing Day (that’s today), I went back to the dike. 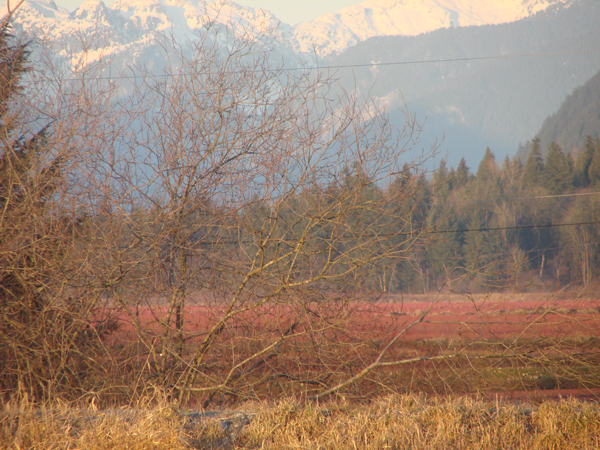 There was a full winter sun flooding the marshlands. 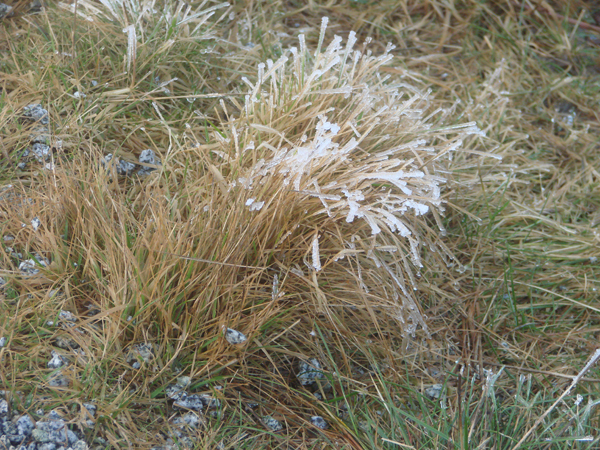 The winter grasses were crisp and precise. 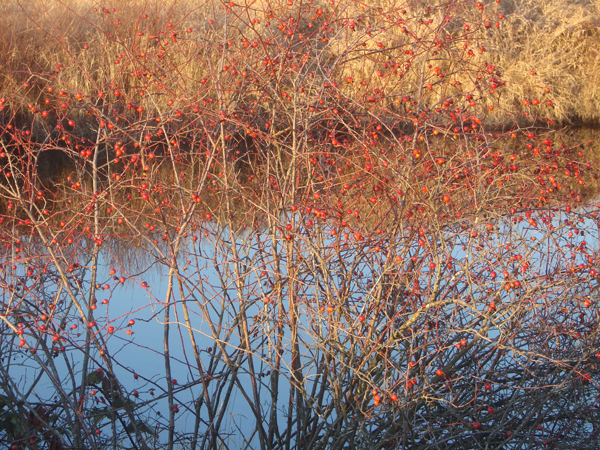 In places, the river and ponds have frozen over. 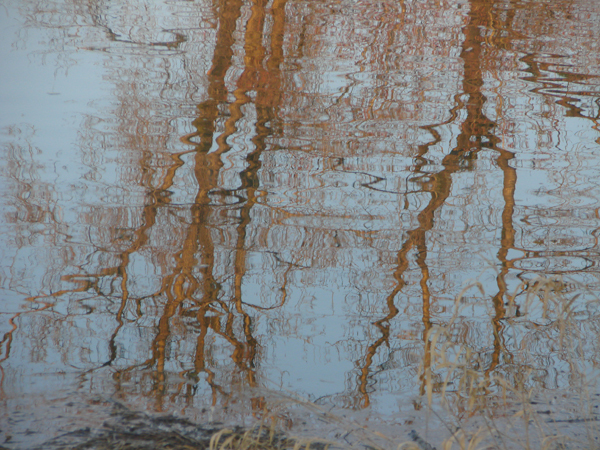 In others, the water is still beautifully liquid, absolutely unruffled, still, clear and reflective. Two days. 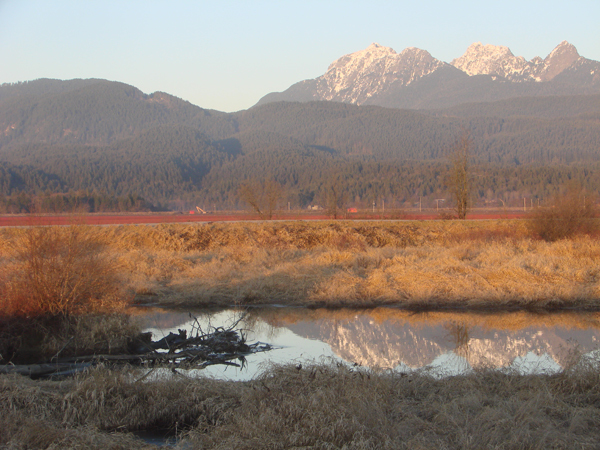 Two widely varied landscape conditions. The fog obscures things. It takes away the non-essentials. 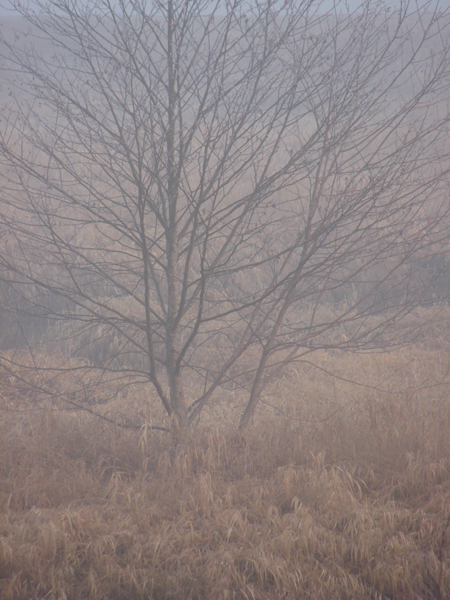 When I photograph a tree, that’s all there is – the winter skeleton, bare and lacy. The details elsewhere are not necessary. The object blurs. The background unifies; or you might say that it has dropped off the edge of the continent. It’s gone. In the sunshine, every leaf, every twig, every tree trunk shines with a golden self-importance. The shadows are long. On Boxing day, there were a lot of people out walking with their mates, their children, their friends. Dogs are pulling on leashes or running after fluorescent coloured tennis balls. Hardy souls are running for their lives. Some are pumping away on their bicycles, weaving in and out amongst the throng of walkers. New cameras and field glasses abound. 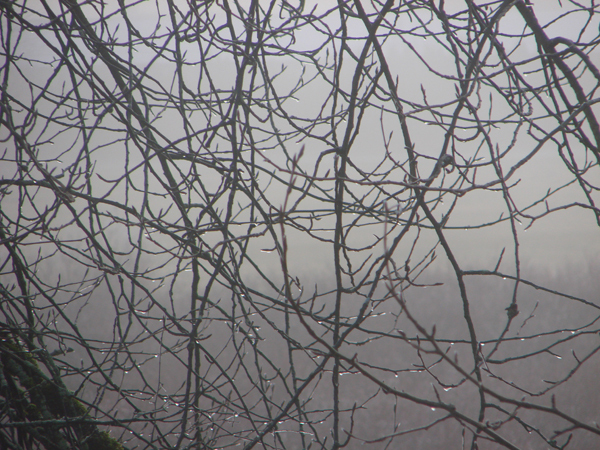 A group of twenty-somethings came towards me just as I was listening to a most beautiful sound: Ice that coated the twigs was beginning to crack and melt. It was like a whispering of bells. No! That doesn’t quite describe it. It was like the tinkling of wind in a distant crystal chandelier, faint and delicate. “Listen, ” I entreat them. It is a fragile innocent sound. “Oh, it’s just the ice melting off the tree,” says one annoyed young man, satisfied to have explained it satisfactorily. He moved on, calling “Come on, guys, let’s go!” He was missing an essential element of wonder. The group went forward taking only seconds to reinstate their happy chatter, drowning out the miracle of crackling ice on tiny twigs. Two girls lagged a bit, still stretching their ears towards the delicate sound. Today, the only sound of note was by the big lagoon, frozen over, skittering like a bird with a high pitched call as three children threw stones across the new drum of ice. 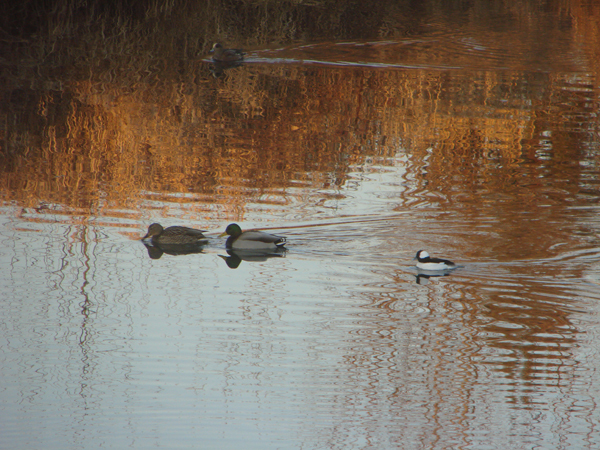 Today, there were scoters and bufflehead ducks in amongst the mallards, swimming together in a multicultural harmony. They are happy that the river mud has unfrozen and they can dive into this murky brown liquid to find edible treats. Their ducking and diving create patterns on the still-water surface. I’ll post the sunny ones on the next post. Did I count that right? Is that ‘t’was the night before Christmas”? aka Christmas Eve? I know that is tomorrow, but I will be busy cooking and preparing tomorrow. I’ve turned down several requests to go Caroling. I refuse to go into the malls. That’s plural because I’m living in Mall City. 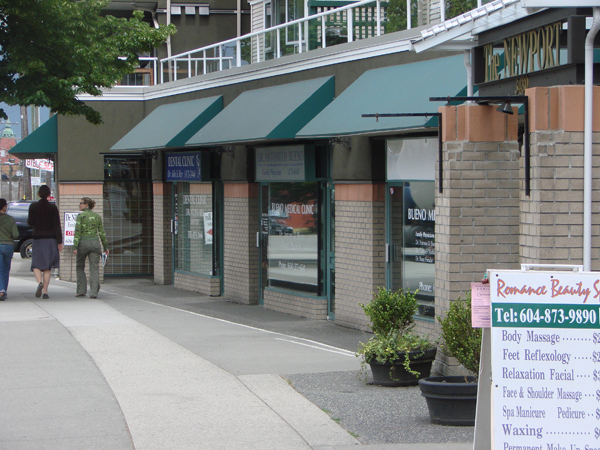 In a very short space, in a very small community there must be at least 15 malls. We are the outpost of bedroom communities. Slightly closer to the big city, we adjoin another bedroom community and they are just about as bad, but they’ve got the Super Malls with the Super Stores; and one step closer in to Hub City, there is the Big Box mall where I do my food shopping. Arghh! They’ve ruined my pleasure in Christmas Carols completely. One can’t go anywhere without being invaded by soppily orchestrated Carols. They jingle in elevators. They pervade every corner of the big department stores and big supermarket grocery chains. They are piped in beside charitable fund raising boxes attended by benumbed “elves”. I know they are elves because the newspaper had an advertisement for them in November, looking for people who would ring their bells and chant the name of the organization collecting your dimes, pennies, nickles, loonies and more hopefully, two-nies. Argh! There is again! Tune-ies! Silent Night, a beautifully felt, sentimental thought in sync with what we are supposed to think is the Christmas Spirit, has been so overplayed that I hate to hear it, especially jazzed and upbeat or mockingly translated into blues – or conversely when it is sung in tempo for a dirge. Here comes Santa Claus, Dashing through the snow with Jingle Bells ringing. The little drummer boy, It came upon a midnight clear, Frosty the Snowman. They’ve been done to death. I can’t listen to them anymore. I can’t sing them. They’ve been ruined, for me, by their mindless repetition. Maybe I’m just an old crone with memories of when it was different. We were allowed to listen to the radio one hour after school. There was no television yet. We listened to theatre including The Lone Ranger and The Shadow and we listened intently, because if you missed something, there were no replays, no possibilities of recording it to tape or CD or DVD. It was played through, often live, and then it was gone. 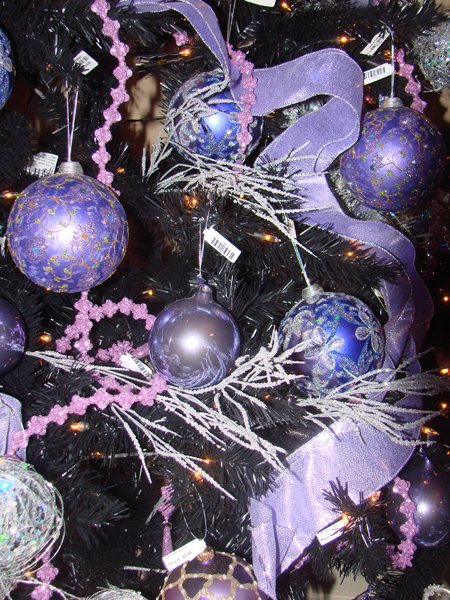 Now even your telephone ring can be set to a Christmas melody. At Christmas, we gathered around the old piano and sang. Mother had learned the tunes and some simple chording. Every year, she bought one more piece of sheet music. Every year, we added one more tune to our repertoire. We sang lustily and laughed together, all gathered in the living room for this festive day. If I need to listen to a Christmas Carol now, let it be Christmas in Killarney (with all of the boys at home). This song somehow escaped the muzac elevator tapes and is never thought of for Caroling in old folks homes. Not that I’m in one, you understand, but I suffered the daily afternnon onslaught of them with Mother while she was a resident. Cloying. Sentimental. Repetitive. I blessed the one and only day when a group of musicians came from the nearby music school and played a real concert of Fauré, Debussy, Ravel, Rachmaninoff and Elgar quartets. Now that was a treat! And none of them were the overdone favorites – each was fresh and crystal clear. Please give me a Silent night. No, not the song. Just a pure, clear meditative silence! Perhaps you will remember that I looked after some cats in Vancouver in September. 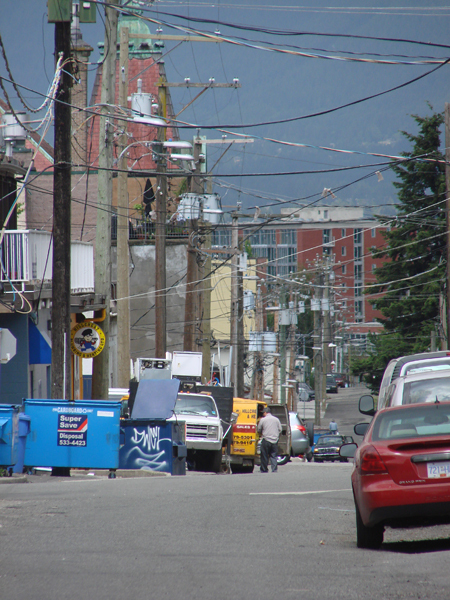 While I was staying in Vancouver, I had the opportunity to walk around Upper Main Street for an afternoon. It had been a long time since I had browsed along the street full of antique and collectible shops, the vintage clothing places, funky restaurants and cafes. 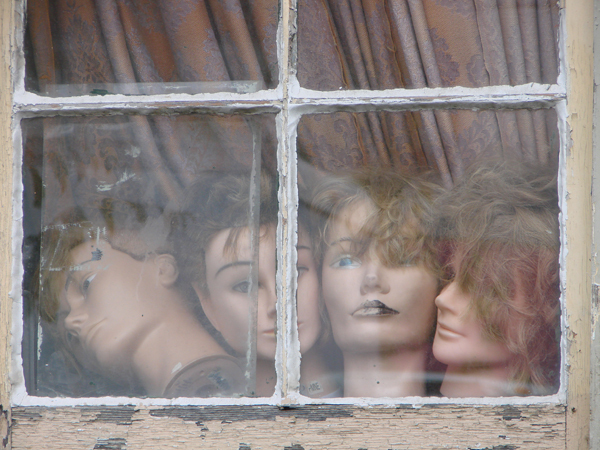 It’s a district with character and there are lots of things to notice and to explore. Artists and artisan live in this area as well as middle and lower middle class people. There is a real mix of cultures and ethnic origins. It’s a lively and interesting place to go. 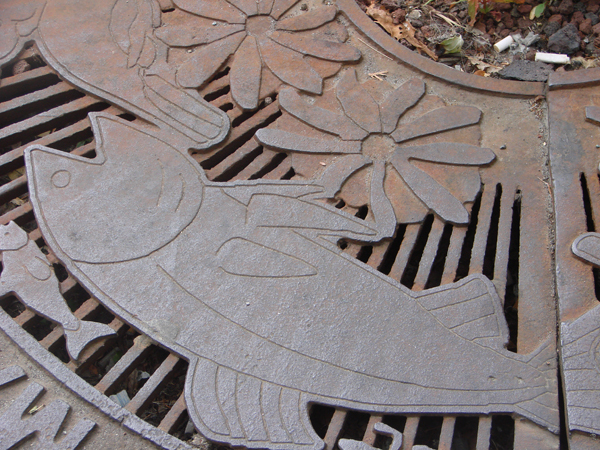 It has the feel to it that made Robson Street famous. But Robson Street was taken over by the big name designers and it’s nothing but current fashion shopping now. The character that made if famous is no longer there. It’s just commercial. 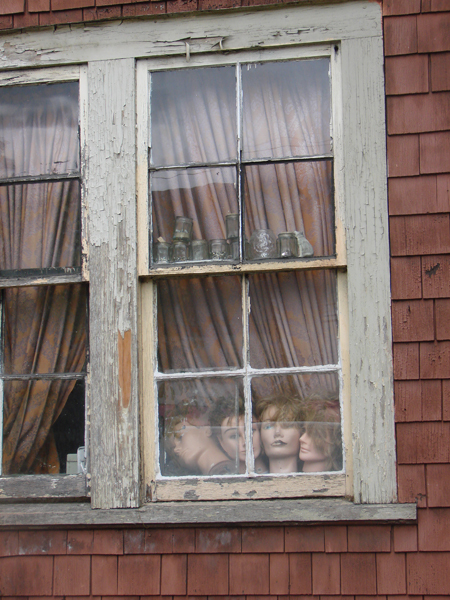 On the other hand, here are a few of the things you can see on Main Street in the Mount Pleasant area of town. 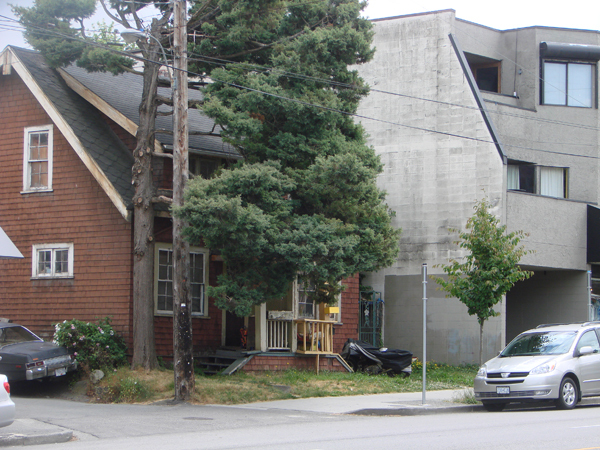 Most of the older buildings are one story; a few are two story, and only now are they being replaced by three to five story commercial buildings. I understand the economic reality of business men wanting to make the most money possible from their little patches of city land, but I regret their need to wipe out the culture of an area while doing so. It’s just too clinical for my taste; though I’m sure the newer buildings are easier to maintain. It just feels so depersonalized to me. So when I see a sign like this, I just have to laugh. It’s just the kind of humour that this area engenders. 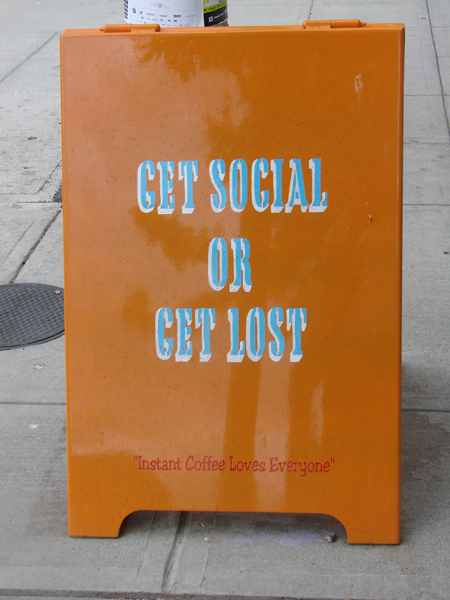 This sign sits outside a cafe. It’s not even really an advertisement, but it’s in your face. It makes you notice and it makes you think. Maybe it even makes some think to turn inward and ask for a cup of coffee. Who knows? Watching all the activity day by day is this nonchalant denizen of the Main Street walk, an outdoor cat, unphased by the constant traffic and many passers-by – browsers, strollers, street people, customers, merchants, coffee seekers, artists, dealers, shoppers, joggers and all the rest. 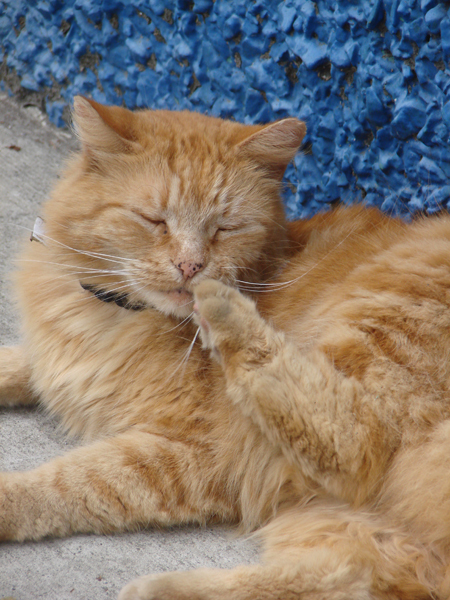 He sits close to the building up against a blue-painted stucco wall, cleaning between his toes, coiffing his whiskers, cleaning his ears. And when he is done? He stretches lazily, rolls over, finds himself a new position and snoozes in the sun. So if you didn’t get out for your exercise today, I hope you enjoyed this walk with me going looking for beauty in the streets of Vancouver. Heather took her coat and hung it in the closet by the door. She may have answered but it wasn’t clear. “How much time does it take to get there?” asked Kay, mollifyingly. It was unlike Jason to ever criticize. He was a man of well-practiced patience. “Half an hour there and half an hour back. But we need at least twenty minutes for the photographs,” He replied. Kay calculated rapidly. It would be nip and tuck. He was such a generous brother-in-law that she hated to see him miss something he had his heart set upon. It was agreed then that the two of them would go though the timing was tight. Heather would have a nap. Jason looked sufficiently appeased. True to her estimate, Kay was ready in a hurry. It was a lovely day. After three weeks of rain, the sky was beautifully clear. 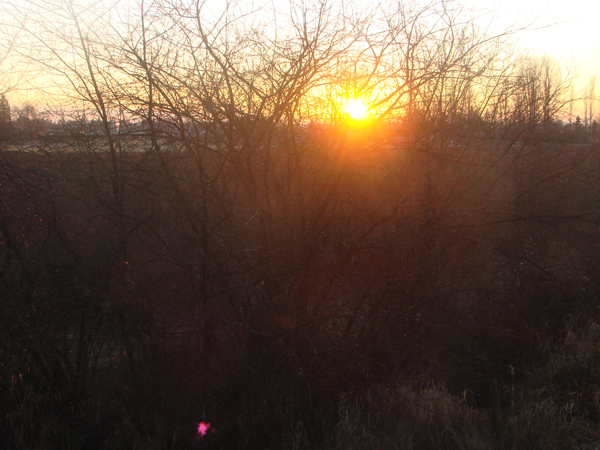 Though it was early, the sun was already headed toward the horizon. The shadows were long. With the clear skies came low temperatures. Early morning frost had not evaporated in all locations and a fog was coming up between the trees as they passed a small lake. Kay questioned Jason about his photography assignment. As they came to the forest company’s logging road, a large truck bearing a full load of stripped logs came towards them. Jason waited while the behemoth lumbered out of the way and then proceeded up the dirt road. After passing several ATV enthusiasts along the forest company road, (all retired men) they stopped at a nondescript location. 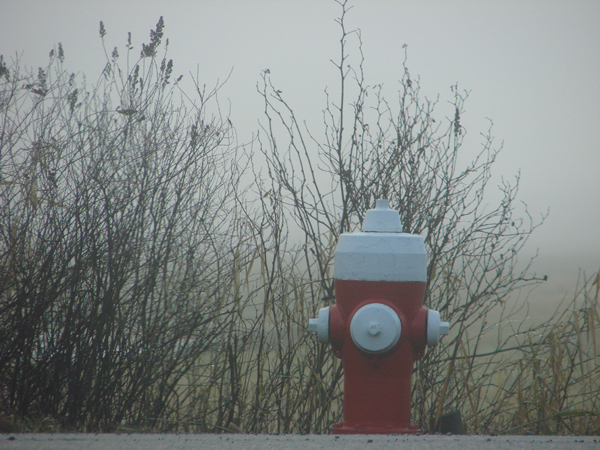 Jason turned his truck to a right angle across the road, dipping dangerously, Kay thought, to the shoulder of the road which dropped off into the forest at a steep angle. 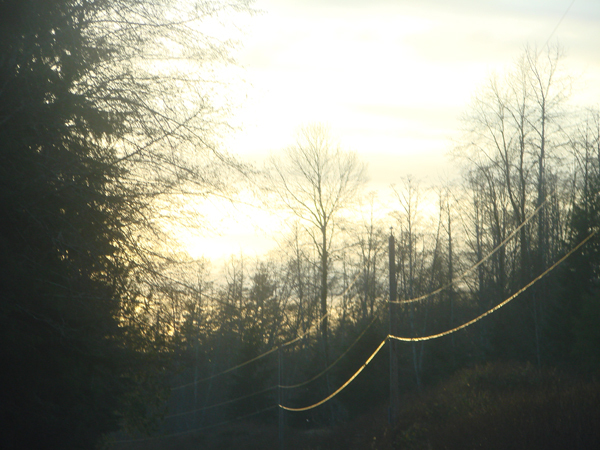 She prayed that no more logging trucks were on their way. Jason then backed up, challenging the shoulder on the other side of the road. 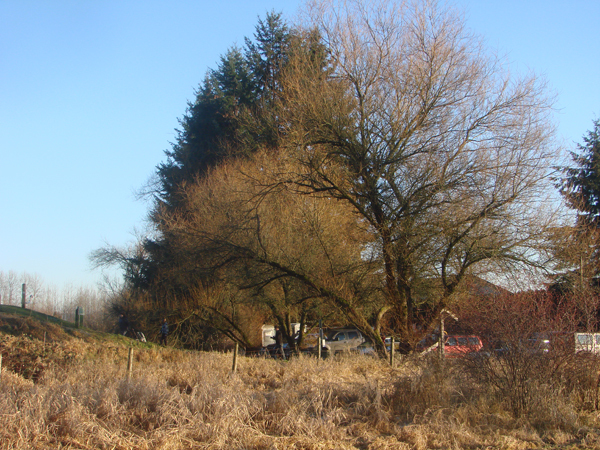 When he finished his manoeuvering, he was facing in the opposite, in the right direction, to go home, and he parked at the side of the road on the narrow gravel border. They got out. Kay followed Jason down the steep path into the forest, holding onto his collar to prevent herself from slipping on the steep muddy trail thus losing balance. Only when the path levelled out did she let go. 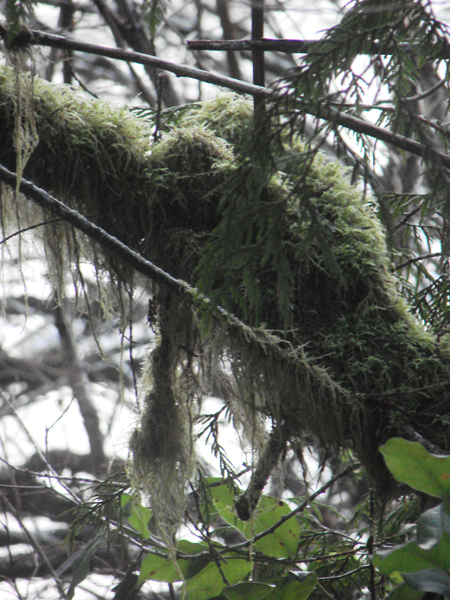 Under foot, there was a thick pad of partially rotted and very wet cedar debris. 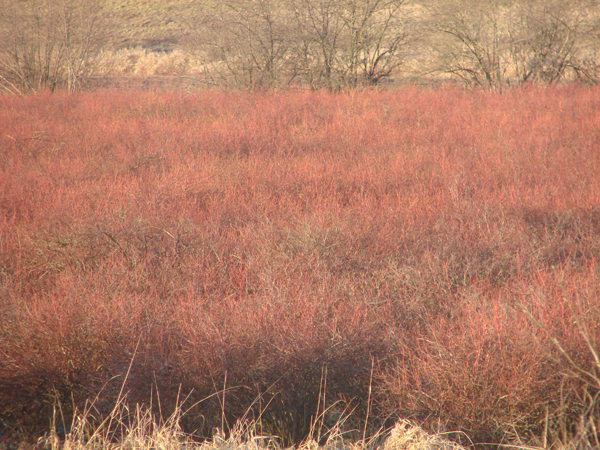 It was springy like peat and about the same rich reddish brown. 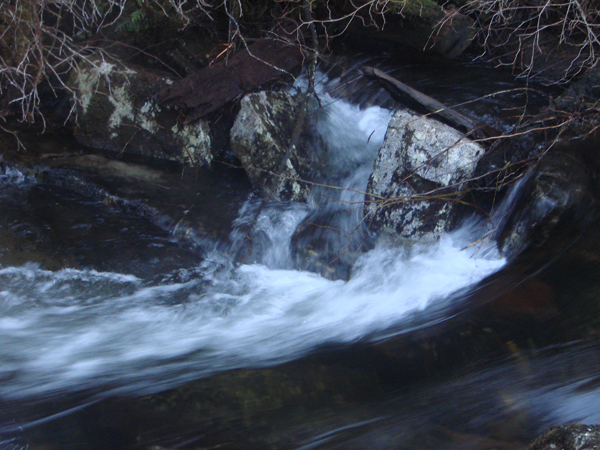 A narrow path led to a narrow wooden bridge that spanned a raging torrent. 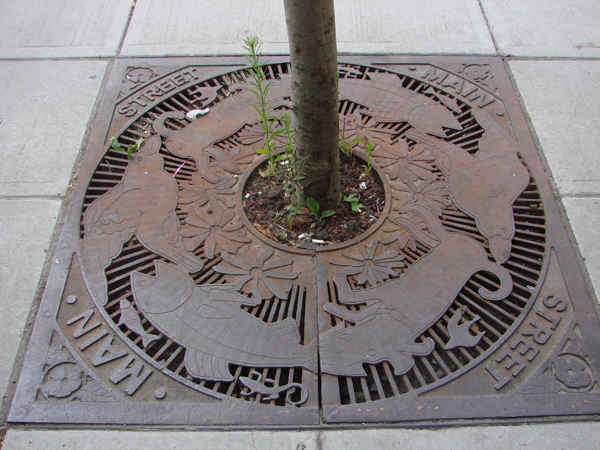 It had metal grating nailed to its surface to prevent people from slipping. 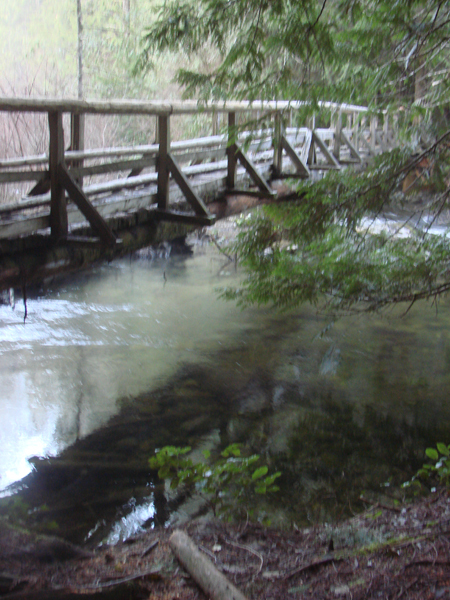 A narrow log railing was covered with ice on either side of the bridge. Here in the forest far from the warming sun, the temperature had not risen during the day. Kay marveled that, even with the river raging below, the men, all retired and most of them over seventy, could replace this bridge without ever losing use of it. 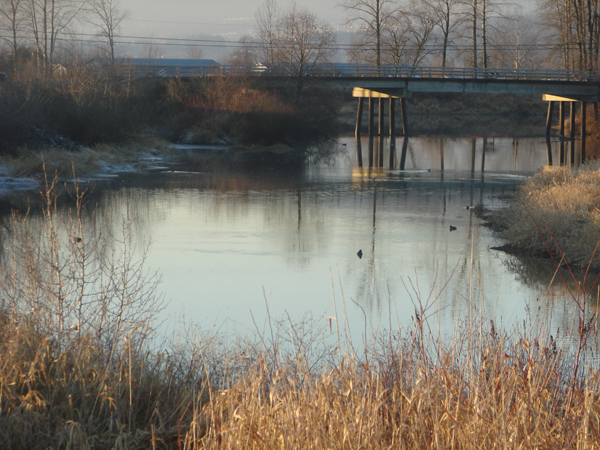 They crossed the bridge, Kay tightly holding her camera and barely touching the icy rail for balance. There were beautiful quiet pools at the edges of the bridge with smooth green and gold rocks below the shiny surface. 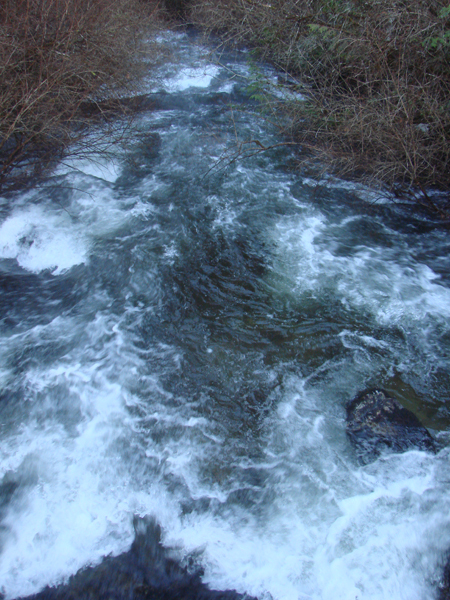 M magnificent waters running in the middle. 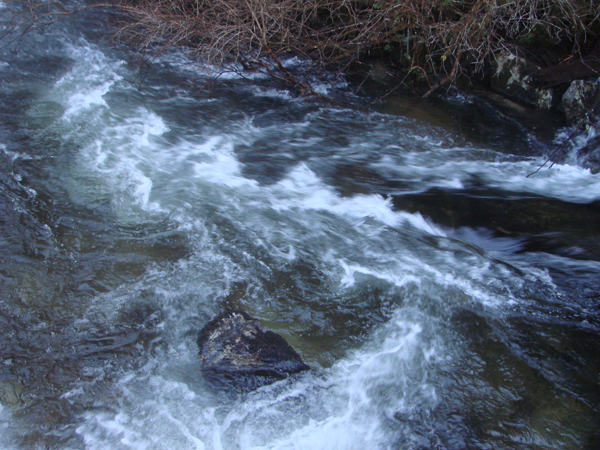 White water was dashing against the stolid boulders. 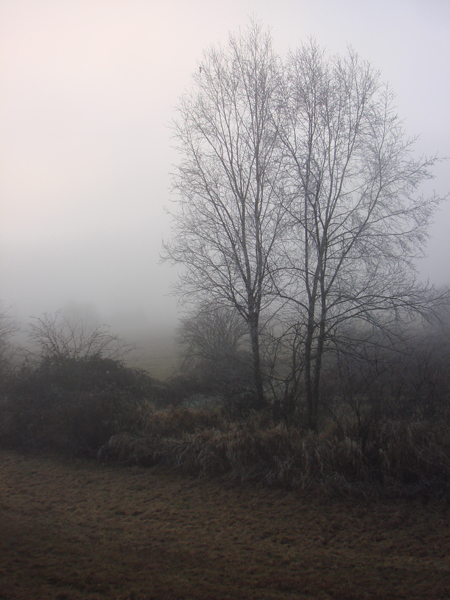 Looking back toward the lake, mists were rising, separating out the various layers of trees. 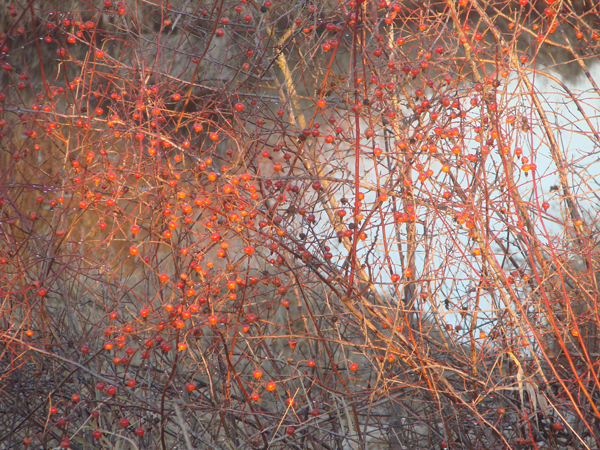 The sun was dipping between the cedar branches. It was getting gloomy at three-fifteen even though the sun had an hour before it would set for the night. 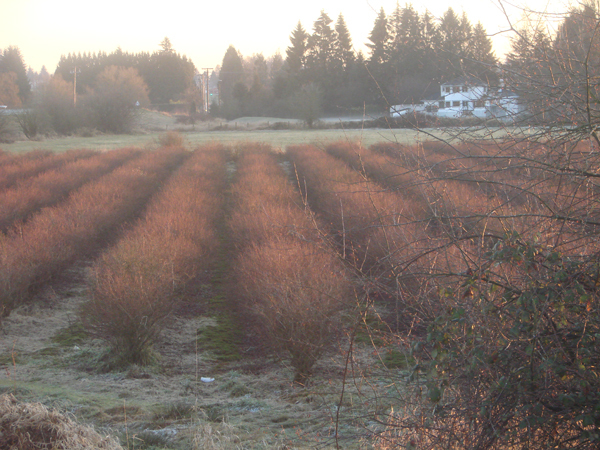 The winter shrubs were sepia-coloured and overlaced with russets. 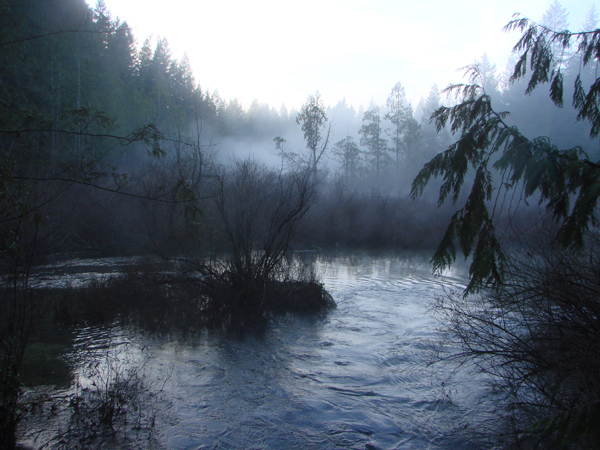 Above them, the cedar branches were a deep green and between them, the lake was black with rising mists a bluish smoky grey. Jason set up his tripod at the other end of the bridge. His homework papers sat illogically white and brittle in this beautiful gloom, on the last step down off the bridge, as he fiddled with his tripod, his metering and his manual settings of f-stops. Kay meanwhile explored things on her own – the pile of cedar logs for Thursdays fire to keep the workers warm and to cook the midday meal; the translucent greens in the quiet pools; the twigs that etched their signatures on the soft shapes of the mists; and the fallen leaves suspended in time in the clear still waters near the stream’s edge. When soon the photography was done, Jason drove them back home, fingers frozen but their eyes full of the forest wonders. 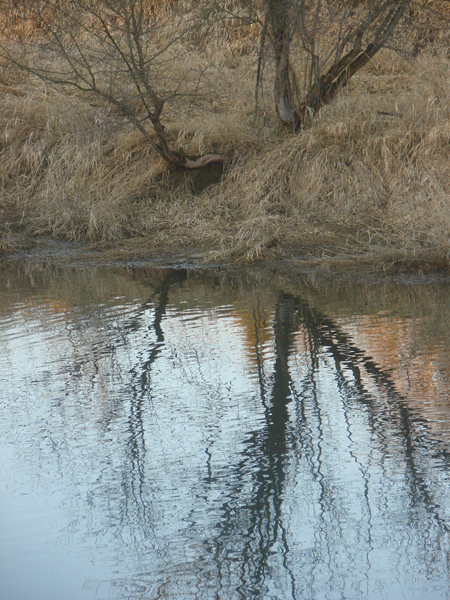 Kay reflected on the curious shape of days. A single event could make or break a day but here was a day that would give her three thrills. The octagenarian joy ride and the church luncheon had been one; this walk in the silent forest had been such an unexpected visual surprise; and there was still Heather’s choir concert to come, in the evening.